It is a year after year repeated cliche but also virtually a certainty. Obscene Extreme Festival in connection with Swedish death metal is an evergreen. There is another special squad for the upcoming volume. Centinex! A band that called it a day in 2006 to start again in January 2014 which is not as important as the year of origin – 1990!!! Old school Swedish death metal! A couple of words that are able to get true fans pretty excited. Be assured Centinex are more than the right guys as those in the line-up have gone through or are members of bands like Demonical, Uncanny or Interment. D.e.a.t.h. M.e.t.a.l.!!! The band was formed around September/October. A rehearsal tape was recorded in March. In July the band entered Sunlight studios and recorded the "End Of Life" demo tape which then led to a deal with swedish Underground Records. A new second vocalist and drummer joined. Gigs around Sweden. The "Subconscious Lobotomy" CD was recorded at Sunlight studios during July and released in October. Great reviews in the press and the band made some gigs in both Sweden and Finland. The second vocalist left the band early that year and from that date Centinex continued with only one frontman. A three track promo tape, "Under The Blackened Sky", was recorded in March which Wild Rags Records released as a cassette EP. A second guitarist came into the band but was kicked out two months later because of personal problems. Gigs in Sweden, Finland and Poland. A new second guitarist joined. In June Centinex entered Unisound studios to record the "Transcend The Dark Chaos" cassette EP. The band released the tape themselves but it was also licensed to polish Sphinx Records. Gigs in both Sweden and Finland. The drummer left Centinex and the band continued with a drum machine. Three new tracks were recorded at Abyss studios. Those, together with the "Transcend The Dark Chaos" tracks + one track from the "Under The Blackened Sky" tape, became the content of the "Malleus Maleficarum" CD. No gigs during the whole year. "Malleus Maleficarum" came in April through Wild Rags Records. One of the tracks was also released on a split 7" EP with Inverted. Centinex signed a deal with danish Emanzipation/Diehard and the Abyss studio was booked for October. Gigs in Sweden and Germany. The "Reflections" CD was released in March, later in the year the album was also licensed to slovakian Rock Extremum Records for a tape version. A deal with spanish Repulse Records was signed and the band entered Sunlight studios to record a new full lenght album. Gigs in Sweden, Finland and Denmark. A line-up change took place right after the recording was finished, a new vocalist and second guitarist joined. The "Reborn Through Flames" CD came out in June and later it was also available on tape through polish Novum Vox Mortis Records. Norwegian Oskorei Productions unleashed the "Shadowland" 7" EP, a limited two track vinyl. Gigs in Germany, Spain, Portugal and Holland. The "Bloodhunt" MCD was recorded at Black Lounge studios. It came out in June through Repulse and around the same time Oskorei released it as a limited 10" picture vinyl with one bonus track. In July a human drummer was taken into the line-up again. "Subconscious Lobotomy" and "Malleus Maleficarum" were re-mixed and edited for a re-release but legal problems with Underground Records forced Repulse to cancel the whole release. The "Apocalyptic Armageddon" 7" EP was recorded during October at Black Lounge. Centinex did two european tours during the year with gigs in Germany, Holland, Belgium, France, Czech Republic and Slovakia. The "Apocalyptic Armageddon" 7" EP came in February through german Deadly Art. The "Hellbrigade" album was recorded at Black Lounge during June and released in September by Repulse. Soundholic released a japanese version which included the "Apocalyptic Armageddon" 7" EP tracks as bonus. The vinyl version was licensed to italian Nocturnal Music, to be released in early 2001. The band appeared on several swedish summer festivals and toured in Finland, Germany, Belgium, Holland, France, Switzerland, Spain, Austria and Czech Republic. The "Hellbrigade" vinyl was released in January. In April Centinex signed a new worldwide deal with english Candlelight Records and the first album for them, titled "Diabolical Desolation", was recorded at Black Lounge studios during July and August. One of the guitarists left the band after the album was recorded. Licensed versions of "Hellbrigade" came out on three different continents, in north America (WW III Music), south America (Picoroco Records) and Russia (Irond Records). 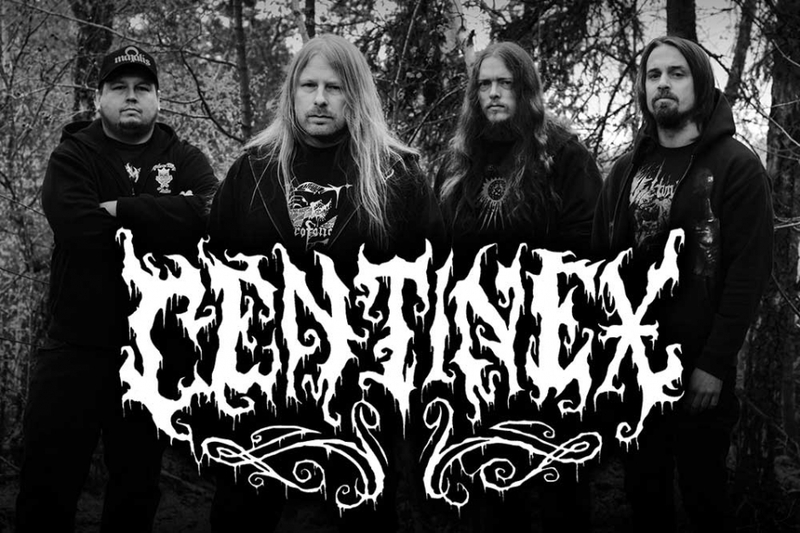 Centinex did their first ever show on US-soil as well as summer-festivals in Sweden and Germany. A new guitarist joined the horde. "Diabolical Desolation" was released in Europe on March 11th and in the U.S on April 30th. The vinyl version was unleashed in December. To support the album Centinex did selected shows around Sweden as well as two festival appearances, one in Poland and one in Czech Republic. During November the band toured, together with Deicide, through out England, Belgium, Holland, Germany, France, Switzerland, Austria, Poland, Czech Republic and Italy. The long-awaited "Hail Germania" split 7"EP + pic 10" MLP was released during the spring. The first six months of the year were spent writing and rehearsing for the new fullenght, titled "Decadence - Prophecies Of Cosmic Chaos". The album was recorded at Black Lounge studios during July and August for an early 2004 release. After the recordings the drummer decided to leave the band, a new one joined a few months later. In June and July Candlelight re-released "Malleus Maleficarum", "Bloodhunt + Reborn Through Flames" and "Hellbrigade", all with exclusive bonus material. The band did some summer festivals in Sweden, Austria and Czech Republic. "Decadence - Prophecies Of Cosmic Chaos" was released in Europe and USA in March. Both the japanese version and the LP-version came in July through two different licensing deals. A limited live 7"EP saw the day of darkness in October. In November Centinex signed a new worldwide deal with Cold Records/Regain Records. The band did quite alot shows especially in Sweden but also a shorter tour in Finland and festival gigs in England and Italy. The band started to write material for "World Declension" in December 2004/January 2005 and spent March and April at Black Lounge studios recording the album. The disc hit Europe in June and the US in September. Limited vinyl- and tape versions are expected to be released early 2006. In the early summer Centinex did record a video clip for the track "Synthetic Sin Zero" taken from the above mentioned album. During the year the band played one off shows and festivals, mostly in Sweden, but also in England, Germany and Finland. The european tour scheduled for October was postponed to January 2006. The band did shows in Germany and Holland during January, followed by a 5-date tour through Spain in February and in March, Centinex played at the legendary Metalmania Festival in Poland. This became also the bands last show as in early April Centinex had reached the end of the line and decided to split up. All the members continued their musical paths in several other bands. On January 24th founding member Martin Schulman announces that he has reformed the band with a new line-up after a nearly 8-year long hiatus. During the spring Centinex records a new full-length album and announces festival appearances for the fall. In August the band signs a worldwide record deal with Agonia Records who will release “Redeeming Filth” - the anticipated comeback album - on November 21 in Europe and December 9 in North America. 2004 "Decadence - Prophecies Of Cosmic Chaos" LP, Hells Headbangers HELLS LP 003 Different artwork and layout. Limited to 566 black + 100 pic vinyls. 1999 "Repulsive Tour '98" Video, Repulse Records, Live in Madrid, featuring Centinex, Anasarca and Stratuz. Official “bootleg” video.